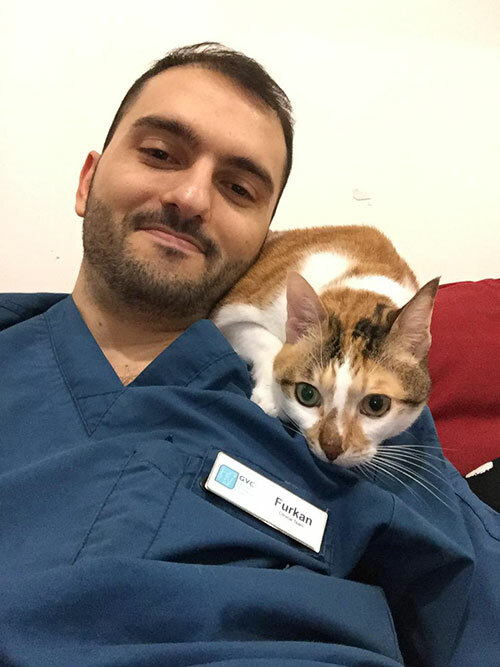 Maggie (officially Missy Maggie Moo Moo) has been part of the German Veterinary Clinic team since June 2018, originally a boarding patient… she is now team member… we can’t describe her in any other way. Maggie has been coming to GVC for years for her annual check-ups, dental procedures and boarding. Earlier this year, her family contacted GVC’s International Pet Relocation Team to help take Maggie back home to the USA with them. 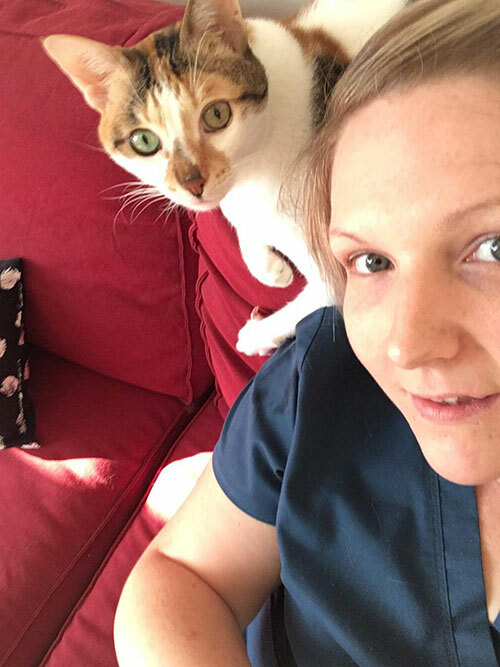 All necessary arrangements were made and Maggie was scheduled to come to GVC’s five-star Cat Boarding Facility while things were wrapped up at home. 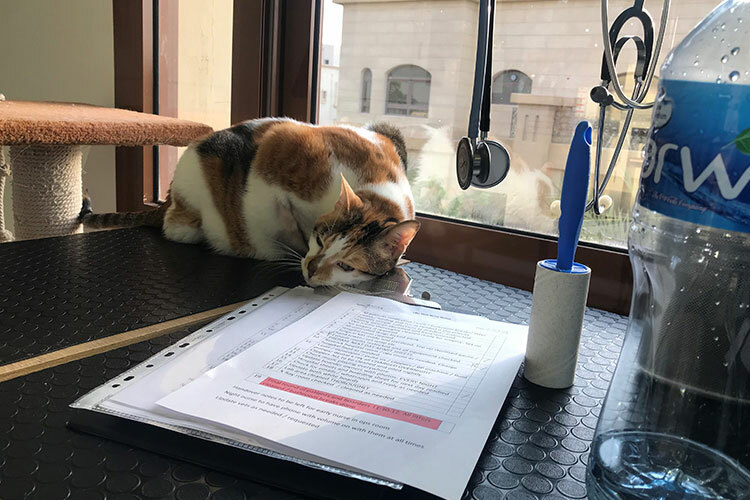 At Maggie’s check in to the GVC cattery, the team noticed that Maggie had indeed enjoyed her UAE lifestyle to the maximum and her weight had crept up to unhealthy levels. So, it was decided that during her stay, a strict diet would be implemented, and a complimentary exercise regime was to start. Not only would this get Maggie to a trimmer, healthier weight, it would also influence the cost of her travel to the USA as pets are charged by their weight! After a day or two in our main boarding room, GVC’s nurses noticed that Maggie was a very shy character and that she preferred to hide and wait for her precious meal times instead of coming out and enjoying the many scratching trees and activity centres that could have helped with her fitness program. Between leaving her home and her family and being fed diet sized portions, Maggie was a little out of sorts and shied away from too much interaction. It was therefore quickly decided to move Maggie to the main inpatient hospital room at GVC, which is the main nursing hub and is where you will find the nurses and vets at any given time. Our inpatient units are custom designed even for long term stays. 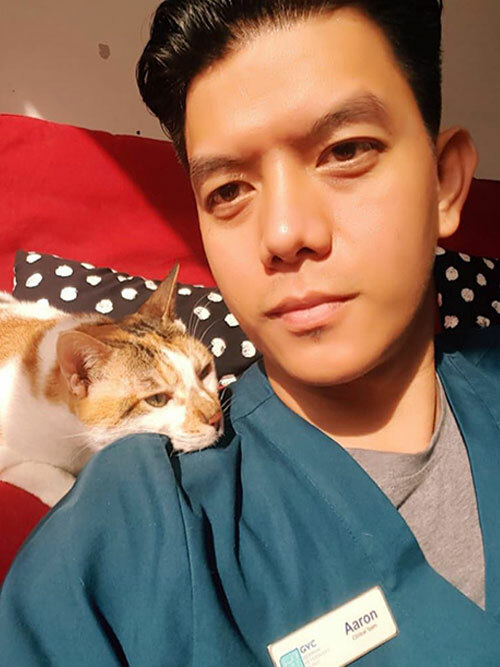 Gentle cat-relaxing classical music is played constantly and the room is sunny and bright with lots of opportunity to enjoy bird watching and sunbathing. It became quickly apparent that Maggie was much happier being surrounded by the nurses! She got to know each nurse individually, and favoured those who gave her the most cat nip (Nurse Sarah!!). The team also took their time with her – Maggie had undergone so much change that we made life as calm and cosy as possible for her. Surrounded by her personal bedding and scratching posts, Maggie became a regular fixture over the summer in GVC. All our Cat Friendly Principles helped to aid Maggie in settling in. Eager to keep her mentally stimulated, Maggie became a pioneer for the “ban the bowl” concept in feline behaviour. Head nurse Nora noticed that Maggie’s weight loss progress had plateaued and instructed all the team to make every meal a hunting game for Maggie. Her daily food allowance was hidden as a treasure hunt and she loved using her innate hunting instincts to find her food, thus working for every meal (as cats like to!). Soon her weight loss program showed amazing results and she was more active than ever with her new, slimmer physique. Maggie patiently awaited news from home, where her family had gone ahead to make sure everything was ready for her before traveling. Unfortunately, some bad luck and changes in plans meant that Maggie had to stay with us a little longer than expected. It was up to the team to ensure Maggie was well looked after for this extended stay… both physically and emotionally. Maggie showed a clear need for human bonding, and no matter how busy the team was, this was always part of her day and Maggie joined the team during their medical rounds meetings, rolling on the floor and demanding everyone’s attention. 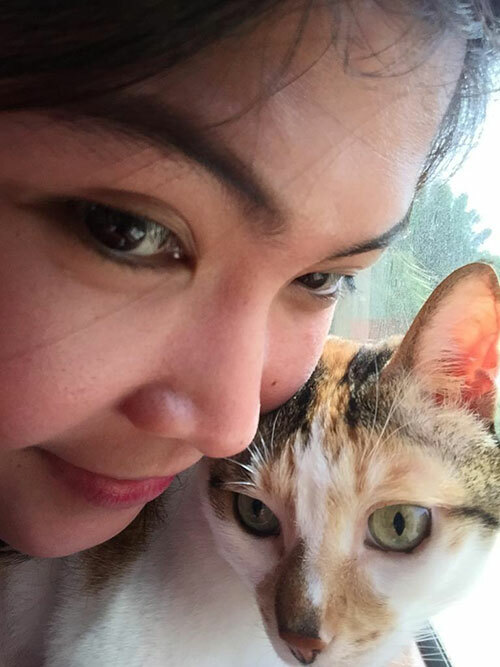 Her new look and healthy lifestyle transformed Maggie into a confident and bold kitty. The once shy and reserved Maggie now has each member of the nursing team wrapped around her little paw. Even Rory and Joanna who work in the pet relocation office downstairs are frequently found enjoying a coffee break with her while she sunbathes! Just as Maggie was ready to leave for her exciting new life in Florida, USA, Hurricane Michael changed everything. Her family home was destroyed in the huge storm and she again had to extend her stay while new arrangements were made. However, just in time for Thanksgiving, Maggie has been able to book onto her flight home and will be reunited with her family in time for the holidays! And, she has lost over 2 kg during her stay! By the time Maggie jets off next week, she will have been with GVC for five months! By making huge efforts in addressing Maggie’s emotional and social needs, we have successfully made it an enjoyable stay, for us as much as her. The entire team are now gearing up for their goodbyes in the coming week. Our International Pet Relocation experts are busy with the final touches to her travel plans to get her home safely. It has been a long journey, and though we feel that we are losing a member of our GVC family, it brings us such happiness to finally reunite Maggie with her incredible, courageous family. We recognize that international relocation is not always a straightforward process, and are here to help… even in the case of natural disasters! Missy Maggie Moo Moo has a very special place in the heart of our team, and we will be thinking of her with her family over the holiday season. Safe travels, Maggie! We will miss you! The GVC Pet Health Club – Premium Pet Care for Less!